We tend to think of our memories as pretty reliable things. We might joke about how forgetful we are, but when we do remember something we assume that it’s accurate. I was 12 years old on September 11, 2001 and I vividly remember hearing about the terrorist attack. I was in our family minivan with my mother, sister, and little brother when the news came over the radio. I wasn’t quite sure what had happened, and was more worried that my mother was going to drive into another car on the crowded in-town roads because she was so upset. We continued on to the roller skating rink where we’d been heading, skated for a while, and then stopped when the announcement went out over the loudspeaker. Several people gathered together to pray, but we stayed off to one side praying just as a family. I felt scared, confused, and very alone. That’s probably not what actually happened, though. Another thing I remember is starting a diary because I was sure that this was such a pivotal turning point in our nation’s history that decades from now some historian would care about what I wrote. I can’t find that diary anywhere, so I have no way to compare my memories now against what I recorded back then. But if I’m anything like other people, then only a little over 50% of these details I remember are accurate. “From that first survey (1 week after the attacks) to the second survey a year later, the overall consistency of the details of how they learned of 9/11 was only 63 percent. At the third survey, three years after the attack, consistency was 57 percent. So people were only a little more than 50 percent right for a lot of the details. People don’t forget that the attacks happened, but the details they remember about them are not consistent. Even just a year later they’d already forgot a significant percentage of details about where they were, who they were with, and what they were doing when they heard the planes hit the towers. Yet as our accuracy goes down, our confidence that we’re accurate remains steady. I first heard about flashbulb memory research while listening to Malcolm Gladwell’s Revisionist History podcast. He has a fascinating two-part series on memory called “A Polite Word for Liar” and “Free Brian Williams” that I highly recommend. It’s crazy to think about how much our memories can change. 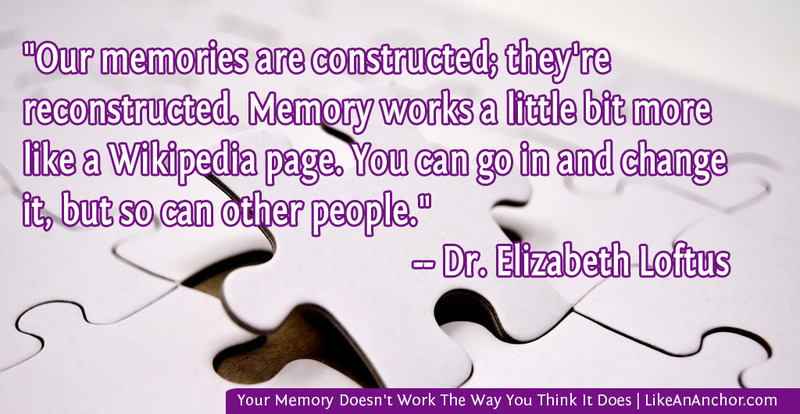 And it also opens up a lot of questions surrounding how we use memory. Take eyewitness testimony, for example. Relying too heavily on eyewitness testimony is the leading factor in wrongful convictions. Not only is the accuracy of our memories dubious at best, but it’s incredibly easy for police to bias and alter witnesses’ memories (often unintentionally). You can read more about this issue in the article “Eyewitness Identification Reform” by the Innocence Project. That brings up another subject — implanting false memories. Most (if not all) of the stories you hear about repressed memories fall into this category. In many cases, these false memories were implanted when a person entered therapy and their counselor said something like, “Many people who struggle with ___ had ___ happen to them. Could you imagine something like that happening to you?” The resulting “memories” have destroyed marriages, torn families apart, and resulted in numerous lawsuits (including former patients suing therapists for implanting false memories). Who Are We If Not Our Memories? Dr. Elizabeth Loftus is a leading researcher in the field of false memories. Her work is fascinating. You can click here to listen to an Adam Ruins Everything interview with her. Or if you don’t have an hour to listen to the interview, you can click here to watch a shorter TED talk. That has me thinking about situations in my own life. I know that when I was dating my ex-boyfriend I framed certain things that happened in an overly positive light, and now that we’ve broke up I remember things differently. Which one is accurate? Is either? Similarly for some formative moments from my childhood. Do I remember them accurately or not? I really don’t know. Our memories are malleable. As my therapist says, sometimes your brain is a dirty rotten liar. I’m sure there are a lot of conversations that went better than I remember them through the lens of my anxiety. Malleable memory indicates I could change how I remember those things, and in some cases that could be beneficial. But how much should we (or others) deliberately mess with our memories? And how should we think about who we know that we know some of the things we’re sure we remember almost certainly aren’t accurate? 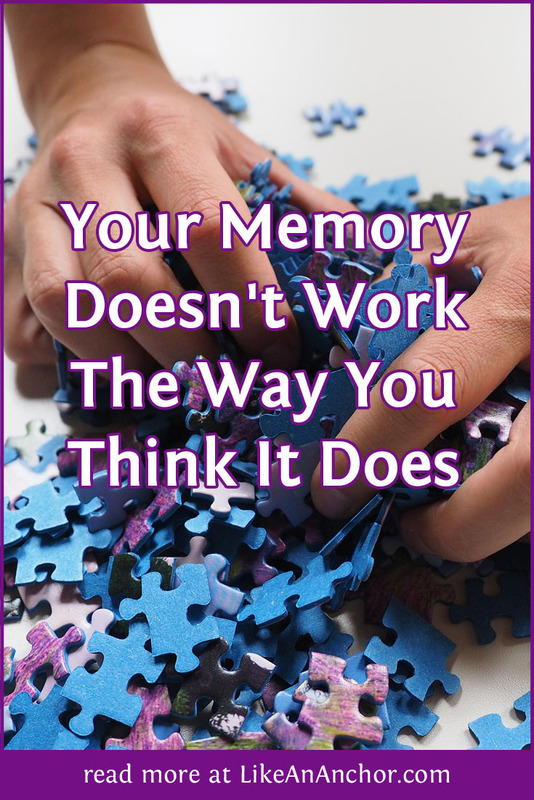 Most people find the idea that their memories aren’t accurate and can be easily manipulated unsettling. I actually find it a relief, since I’ve felt for some time that I can’t rely on my memory and worry that I might have edited things. It’s nice to know that’s how “normal” people’s minds work, even if they aren’t aware of it. And maybe if we realize that, we can be a little more understanding and forgiving of the everyday slips in memory that we and others make. I think there is definitely something to the retrospective bias we can have. For better, or worse, we seem to have the power at times after the fact to remove the emotion from an event and see it in a light that we (possibly subconsciously) wish to. I remember an international trip I went on in high school – at the time, and for about one year after it, all I could think of was the teenage drama that occurred on the trip and how I felt hurt and used – thereby darkening the whole memory of it. Now, many years later, I just remember the awesome travel and experiences I had and I look upon it favorably (as long as I don’t go down the road of wishing to do it over without the drama and start reliving any emotions). So perhaps our detached view of past memories can be more accurate. And yet I wonder if I am just coloring it with a new bias when I recall it. Our perspective is huge!